Some of our Aussie members may have seen some of this .300BLK load development on the Aussie forum but I have done lots more development since then and will add the more recent stuff here too. A sunny afternoon and a a few hours to experiment I decided to load up some .300 AAC BLK cast bullets that Ive been wanting to test on paper.. 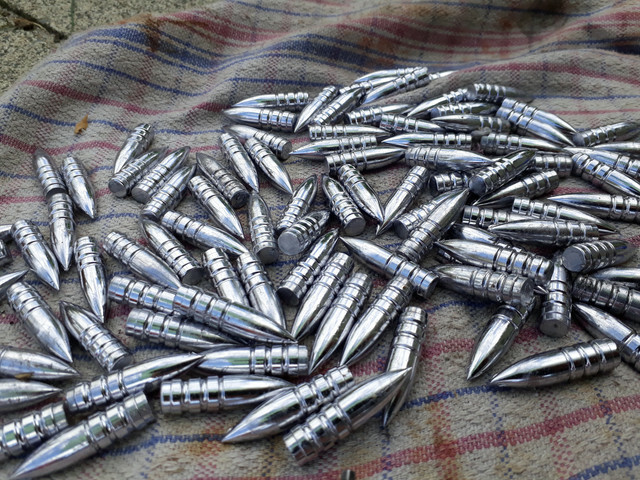 I have some 245gr and some 155gr cast bullets that I wanted to try with and without gas checks to see if the rebated "boat tail" like shape or a flat base would make any difference to group size. There is no real need to fit a gas check as they are only loaded at subsonic speeds. The rifle will shoot half MOA with 240gr SMK subsonic loads but the projectiles are a little pricey so I save them for hunting rather than range work. It also shoots 125gr Nosler ballistic tips at 2320fps which group around an inch at 100y. What I wanted was a cheaper subsonic bullet alternative to use around my property on rabbits and general plinking as it is a rifle I really like to shoot .. 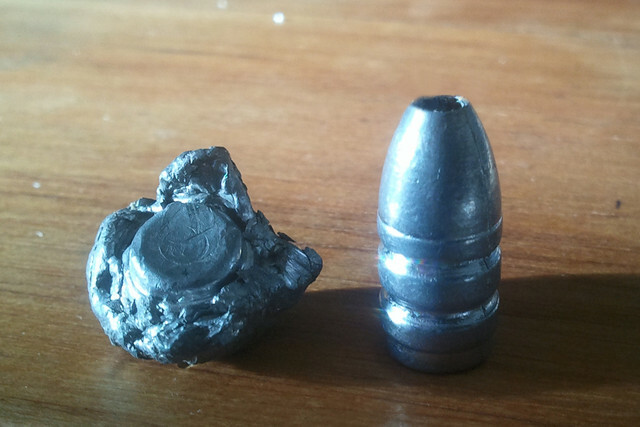 I started off with the 245gr cast bullets from Robert which looks like a “perfect moulds” mould? I loaded them with several powders such as AR2205, AP 50, AP70 and Trail Boss but got the best (I use that word loosely) groups with 8.3gr of Hodgdon H110 both with and without gas checks fitted shooting an average of 1020fps.. this is the result at 100 yards. Fairly average results at best and really inconclusive to whether the gas check makes any difference to ballistics. 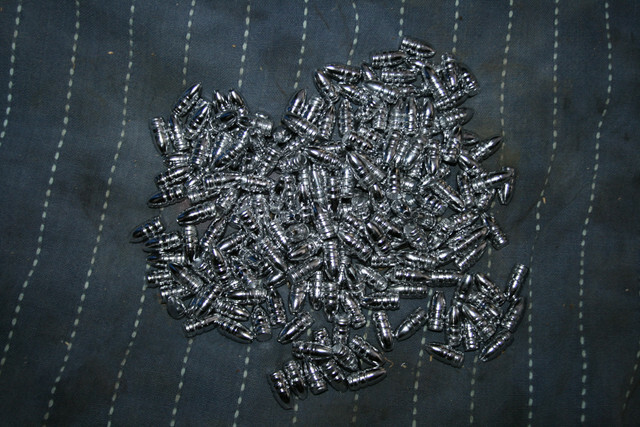 Next up I loaded some 155gr Lee Spitzers that I cast and shoot in a custom big bore PCP air rifle. The twist rate at 1-7" is too fast for these lightweights but I thought I give them a try anyway.. I loaded them with 8.5gr of AR2205 to 1050fps and they are VERY quiet! They are a very low pressure round with that powder and there was a lot of sooty black blow by on the spent case necks.. However these shot far better than the heavy weight bullets and could be fine tuned with a faster pistol powder to bring the pressure up a touch. Besides the flyer in non gas checked bullets the group would have been about an inch. 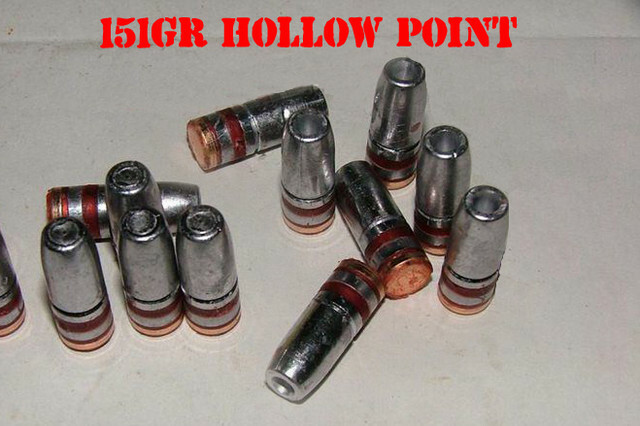 I was very happy to see a group of 3/4" from the gas checked bullets and it is defiantly a contender as a cheap plinking bullet! I will test it further with other powders and at longer ranges very soon. I have a large flock of Canadian geese that frequent a field about 250 yards from my shooting bench so it would be great if these silent lightweights hold stability to that range.. 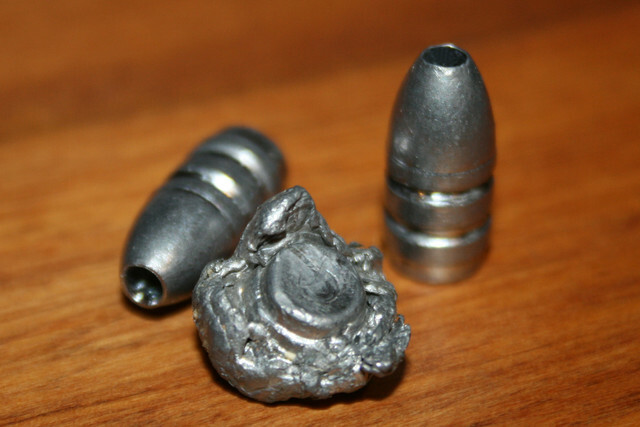 I use pure lead for casting my sub bullets as its natural slippery properties and the lack of tin/antimony actually makes for less fouling. As a subsonic bullet it has no need to be hard. I also found sizing them to .308” instead of .309” also got better groups. I found flaring the case mout lightly before seating gave less bullet damage when seating and no shaved lead rings in my throat, I also use a light roll crimp to lock them into the case which gives much better velocity consistencies. A little more testing with some IMR Trail boss powder and the 155gr bullets over the chrony and had two loads to try, 6.0gr of T/B gets me 995fps and 6.5gr of T/B gets me 1020fps but its an absolute max load and borderline compressed which I find T/B doesnt like that much.. I have my money on the 6.0gr load. It is a higher pressure load than the AR2205 loads I tested as it shows a flatter primer and no sooty "blow by" on the brass when extracted. I do like how clean T/B burns.. It is a super quiet load and shoots 3/4 moa with the 2205 but I would be very happy if I can match that with the T/B without the sooty blow by low pressure issues of 2205. I decided to scrap the compressed 6.5gr T/B loads after putting a few more over the chrony, they showed large fluctuations in velocity as I expected they would.. Trail boss does not like compressed loads. The 6.0gr of T/B felt real good to shoot but the group really fell apart with this powder.. 10 shots in just over 5" on paper! However the Chrony results were very good with only a 18fps max spread over 10 shots. I think I will put up with the sooty low pressure load of 2205 as it shoots extremely well! A very enjoyable few hours on the reloading bench and the front deck.. look out bunnies! madjon_, johnd and 257weatherby like this. Wanting to go a bit heavier than the 155gr cast bullet as my plinker I purchased this NOE spitzer 3 cavity mould to try and was impressed with the results. 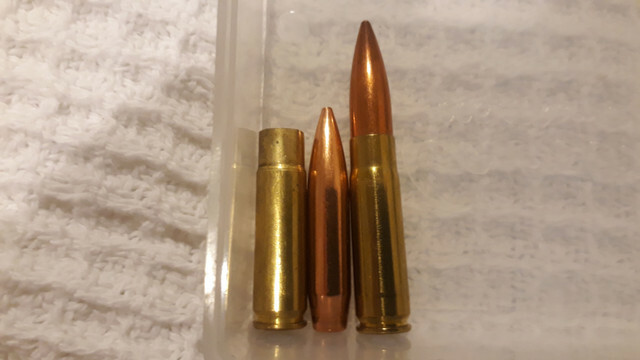 The bullets are pure lead sized to .308 like the others and gas checked which puts them right on 210gr. 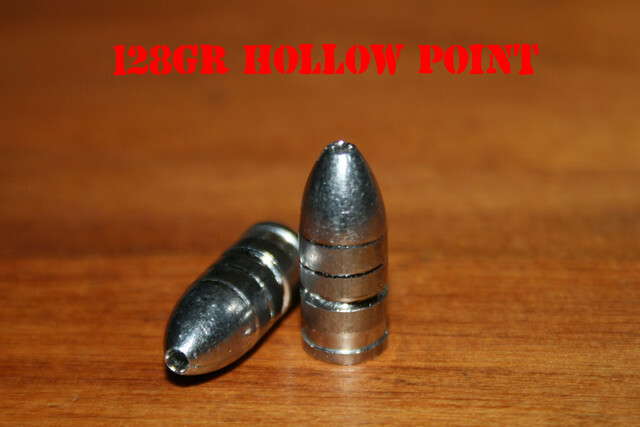 They are a nice long bullet like the 240gr SMK so should perform well on pests too. Loaded with 8.6gr of 2205 and a light crimp puts them at 1020fps AV and they shoot great. almost as good as the SMKs. Unfortunately I didnt have any of the cast bullets loaded when I saw this critter out in the paddock. With a quick drop check on my strelok app I took this hare at 172yds off my BBQ table with a 240gr SMK subsonic. tikka, berg243 and takbok like this. Awesome write up mate! Absolutely love the 300AAC! I've ditched all the cabinet content and just use the 300 now, don't see myself ever using anything else. Its such a versatile round with the Subs and Supers, it meets all my needs and uses. Am yet to delve into the depths of reloading as yet, am using the Hornady SubX rounds and the Hornady American hollow points for all my hunting purposes. Am stoked with both thus far! Thank you, I have cleared out my collection quite a few times over the years and been left with just the BLK or whisper as it was.. eventually I ventured into more cals again until the safe was overflowing again. Like you say it is a very versatile cal that can do mos things. how far is effective range on a deer with the subs? Theres no short answer to that question. How far can you shoot? The 240gr SMK leaving the barrel at 1040fps is still doing 820fps at 1000yds.. if your good enough to lob one into the scone of a deer at those ranges then 1000y is the answer. Most people who hunt with subs shoot inside 250yds and aim for the boiler room but if you are a head or neck shooter and can master the subsonic bullets rainbow trajectory then it can be pushed much further. .300BLK is a very versatile caliber that suits many roles. 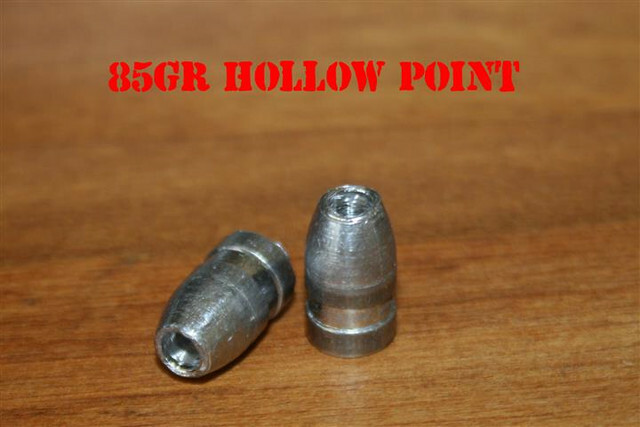 It can be loaded with any 30cal projectile from the 85gr pistol to the huge 250gr. In its subsonic role, the 240gr SMK tumbling is equivalent to 7 times caliber expansion! These high BC projectiles retain energy as well as sub MOA accuracy out to 200y. While the bullet leaves the muzzle at approx 1040 fps, at 100 yards it loses only 3%, travelling at 1011fps & at 200 yards it still keeps on motoring with a solid 984fps. @Wingman, when you measure your groups, I notice your calipers are set over the centres of the two furthest holes of each group, rather than the outside edges. Is this technically/officially the more accurate way to measure a grouping? I guess its just that Im old school and it was the way I learned through military shooting comps. All international benchrest competition was measured "CTC" (center to center) but changed many years ago which is why the old world record figures shot with .22PCP and 6mmBR will never be beaten due to the new way of measuring group sizes. , with not immediate kills on preys from rabbit and hare to goats. The tumbling is not consistent on goats ,sometime penciling through and having to finish them with a second round. And they make massive ricochets if hitting a hard surface at the proper angle even after going through an animal. 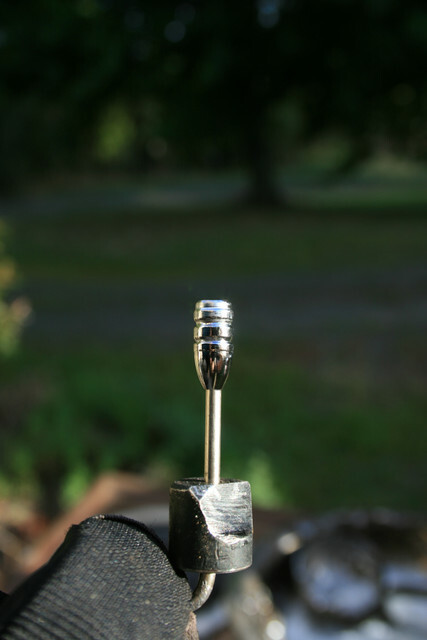 I then switched to hornady 170 gr fbfp . 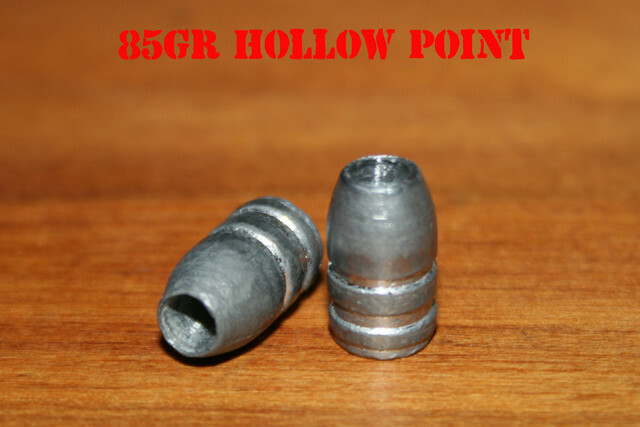 Which I modified with an hollow point as per an old article from Greg Duley. They were killing a bit better but still not very conclusive with a few animal to finish off. As soon as I switched to the 151gr hp cast from Robert, that was a different story, way better expansion, quicker kills and less dangerous ricochets. Three times now I have witnessed two goats standing next to each other being killed by 1 bullet ( twice by a mate at 30 m and 90 meters and once by me at 150 m). I have started to used the 190 gr sub x from hornady, but their load is a little bit inconsistent and I have only tried it on one goat so far. My conclusion from my limited experience is that any weight above 150 gr produces energy which is wasted once the bullet passes through the animal, the noise is more important and so are the ricochets. @ Friwi I totally agree mate, goats are very light bodied and I have had many pass throughs with even high velocity rounds.. if you dont hit bone results can be disappointing. I stopped body shots many years ago as the head is no smaller kill zone as the chest vitals. The 300gr .338 whisper I had was a different story.. I saw many goats body shot and their legs just went out from under them and that was it. A lot more energy dumped with that one I suspect and the longer bullet was less likely to pass through even on lightly built goats. I have shot many of the lighter HPs including Roberts 150gr HP and some of my own custom mould lighter 85gr and 105gr HPs with great results on rabbits/hares but have not put them on goats as Im favouring the .223AI at the mo with longer range work. Yes Std Rem700 AAC Tactical with the factory 16" 1-7" twist 5R rifled barrel. To be honest its not the most accurate .300 BLK/Whisper Ive owned, the 1-8 twist 17" long Shillens shot way better and was better with the lighter 125gr supers as well. 1-7" is too fast for the BLK in my opinion, fine for the 12" pistol AR15s but limited by pressure for the longer rifle barrels with high velocity loads. Ive used JD Jone's original 240gr recipe since the beginning of this cal and it has shot the best in every .300 Ive owned (12) regardless of barrel length and twist. Start with 9.3gr or H110 behind a 240gr SMK. Tune to 1020fps from there. if that doesnt get you inside an inch at 100y with 5 shots nothing will. Cheers for that info. Im going to put together a 300 BLK and im trying to decide between just buying a Remmy or getting a 700 or howa action and chucking a TF 1-8 suppressor barrel on. If I can get a donor action cheap enough im guessing it would be about the same cost all up.